They say, “Seeing is believing.” And, that’s never been truer for those information security professionals who have attended a Cylance’s coast-to-coast “Unbelievable Demo Tour”. The good news if you have never been? We’ve added a stop in Toronto, for the first and arguably the most anticipated product demo. 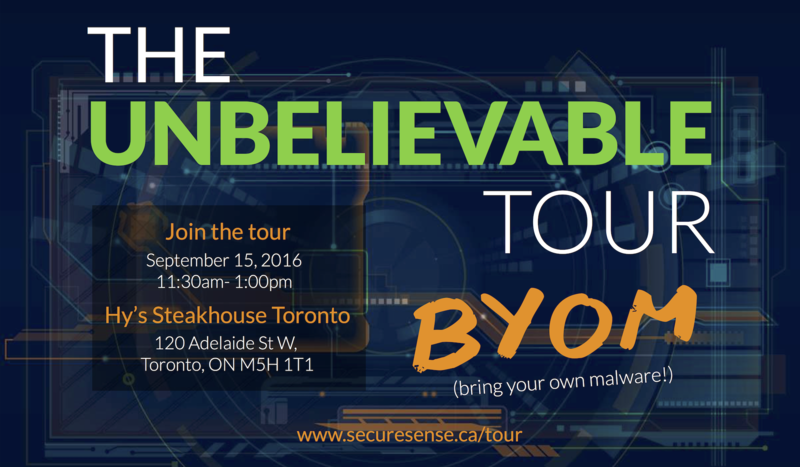 The Unbelievable Tour commences with an overview of Secure Sense and Cylance. We take a deep dive into who Cylance is and what it is that they do differently, followed by an explanation of the demo itself. Then we pit CylancePROTECT against 100 of the latest virus samples and 100 mutated virus samples. You will see how CylancePROTECT fares in real time, with no smoke or mirrors! Finally, we will review the results of the demonstration together and finish up with a Q&A session. The next generation of antivirus is here, and we want you ahead of the security game. Attend on September 15th for a no obligation, free lunch event. Hey, you may even win a prize during the giveaway!